Certain rare sports cars are extraordinarily special. The sports car model as well as the specific automobile can be influential and famous. The Jaguar XKSS is one of the rarest and most beautiful sports cars in the world. Before the popular, stylish E-types of the 1960s and early 1970s, the amazing, finned D-type Jaguars were driven to wins at Le Mans in the 1950s and now easily sell for over 1 million dollars. Scarcer still is the XKSS. Only 16 were made before a fire destroyed the factory. The Jag-lovers Web Early Jaguars were photographed at a 2001 Jaguar of North America Challenge Championship in Franklin, Tennessee. The 1965 Aston Martin DB5 from the James Bond movies is famous. Two customized DB5s with machine guns, revolving license plates, bullet-proof rear shield and other gadgets suitable for a secret agent with a license to kill were manufactured for Goldfinger, while another two went on publicity tours. One is on display at the Louwman Museum in the Netherlands and a second was recently sold at an auction in Arizona for $2,090,000. The McLaren F1 is a fast sports car with a top speed of 240 mph. Production stopped in 1998 after only 100 were built. According to the official McLaren site, there are eight authorized service centers around the world for these rare sports cars. The famous story goes that after World War Two Ferruccio Lamborghini built a successful tractor factory and drove a Ferrari sports car. One day he complained to Enzo Ferrari, the founder of the Ferrari sports car company, about his clutch. Mr. Ferrari told Mr. Lamborghini he should stick to tractors because that's all he knows how to drive, so Mr. Lamborghini developed the powerful and luxurious Lamborghini sports car. Similar to the Ferrari's prancing horse, the Lamborghini has a bull as its symbol. The Miura, sold from the 1960s to the early 1970s, is the name of fierce Spanish bulls bred for bullfighting. The Diablo from the 1990s is another exceptional Lamborghini. British race cars are green, blue is for France, and Italy's racing color is red. The Testarossa, which means redhead, is a popular sports car from the 1980s designed by Pininfarina of Italy. In 2002, the Enzo Ferrari was named after the company's founder. Though a production car manufactured for the street, it is similar to a Formula One race car. The Ferrari Company donated an Enzo to the Catholic Church to benefit the tsunami disaster in Southeast Asia. It was sold at auction for well over 1 million dollars. Tipo 61 is the official name of the Maserati Birdcage. This beautiful race car, manufactured in the early 1960s, has an influential, lightweight tubular chassis. In 2005, to commemorate the 75th Anniversary of the Pininfarina design firm, the Maserati Birdcage 75th concept car was built. Like the original Birdcage, this futuristic automobile is white. The most important automobile ever made is the Ford Model T. By the end of World War Two, though, many Model Ts had been scrapped. These abandoned old cars were perfect to transform into powerful hot rods. Today, T-Buckets are made with fiberglass bodies and new parts because original Model Ts are scarce. Plymouth Prowlers Association - A modern design based on classic hot rods. Carroll Shelby, an ex-chicken farmer, raced the Maserati Birdcage and also won at Le Mans in an Aston Martin back in the 1950s among many other racing accomplishments. In the early 1960s, he added a Ford V8 engine to a British AC Cars body to create the AC Cobra, one of the most powerful sports cars of the 1960s and Ford's rival to the Chevrolet Corvette. Shelby went on to develop the Shelby Mustang and was involved with Dodge's Viper. 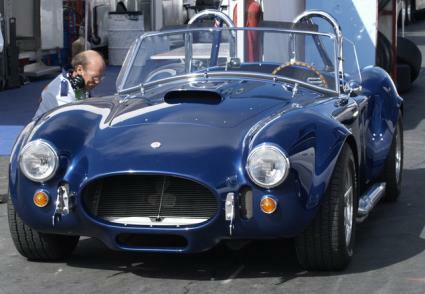 Original Cobras are some of the most desirable rare sports cars from the United States. The Chevrolet Corvette is the quintessential American sports car. The classic Corvette C1 and C2 models from the 1950s and 1960s include the Stingray that stopped production in 1967. The split-window coup Stingray is from 1963.